Volvo Ocean Race leaders Telefonica will face a judicial hearing at the end of the fifth leg over the use of sails in the last leg to New Zealand. The International Jury will schedule a hearing during the next stopover in Itajai after receiving a report from the head of the Measurement Group over the sails carried by Team Telefónica during Leg 4 from Sanya to Auckland. Telefonica finished third in the leg to New Zealand behind Groupama and Puma after winning the first three legs of the race. No date has yet been set for the hearing into the protest, which concerns an alleged breach of the notice of race 5.2.2. Under race rules, each boat is required to carry on board one storm trysail, one storm jib and one heavy weather jib, plus a maximum of seven other sails, made up of a maximum of one mainsail, two headsails, three spinnakers and one staysail. An announcement will be made once the International Jury decides on a date for the hearing. 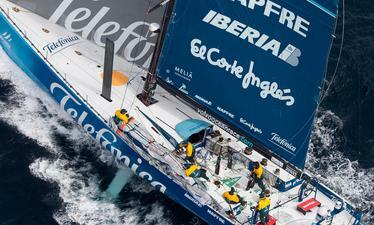 Telefonica currently sits in fifth place in the six-boat fleet during the fifth leg from Auckland to Itajai.